Cutter compensation is a great way to dial in a hole to be a very precise size. 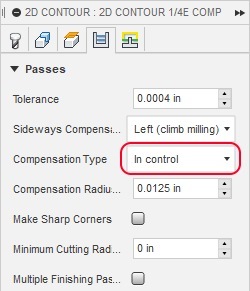 I learned about cutter compensation from a John Saunders video How to Use Cutter Comp on a Tormach! WW180. In his video, he's using PathPilot on a Tormach. But I have Mach3 with a Taig, so the workflow is a little different. But not by much. First, some background. 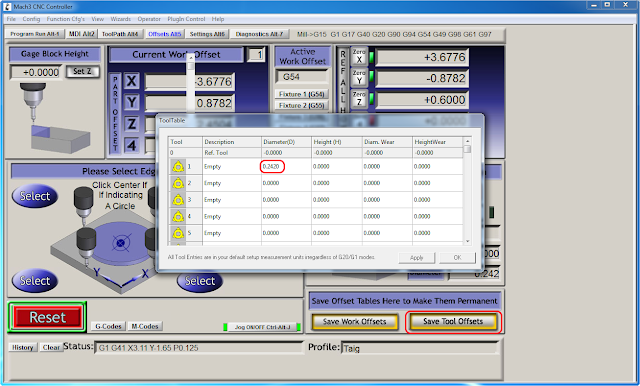 Cutter compensation is done use a set of g codes: G41 and G42. Which one to use depends on the direction of cut. Fortunately, Fusion 360 handles choosing the correct one based on what you're trying to do. Here's the high-level overview of how it works. Normally, Fusion 360 will calculate the correct location of the tool path based on the diameter of the cutter. In the picture below, you can see that it's moved the tool path for the cutter inward by half of the tool diameter. In other words, Fusion 360 is handling the calculations to compensate for the diameter of the cutter. Cutter compensation in Fusion 360, at least at the time I'm writing this, is only supported for 2D operations. This may be a little hard to see, but now the tool path (the blue line) is exactly along the profile, rather than 1/2 a diameter away. Once I made those changes, I was able to slowly change the diameter of the cutter in the Mach3 tool table until I had the hole just the right size. I started with 0.25 and then worked my way down to .244 (I made the hole in CAD slightly smaller than my target).